As Commissioner of the Georgia Department of Human Services (DHS), Robyn A. Crittenden oversees the state’s work to strengthen Georgia families and protect vulnerable children and adults from abuse, neglect and exploitation. Gov. Brian Kemp appointed Crittenden DHS Commissioner in January 2019. She had served as DHS Commissioner from July 2015 until November 2018, when then-Gov. Nathan Deal appointed her as Georgia’s 28th Secretary of State. Crittenden completed Kemp’s unexpired term as Secretary of State. 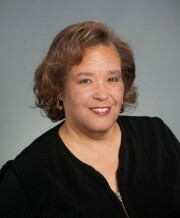 Crittenden is the first African-American woman to serve as a statewide constitutional officer in Georgia. At DHS, Crittenden has brought about several award-winning changes in technology to enhance human services available to Georgians. Among these innovations are Georgia Gateway and a mobile application for customers of the Department’s Division of Child Support Services. Georgia Gateway provides customers with a single point of access for public assistance programs across multiple state agencies. The Child Support app allows parents to access information about their cases via their mobile phones. Crittenden’s work combatting senior hunger is nationally recognized. The DHS Division of Aging Services’ comprehensive State Plan to Address Senior Hunger is the first of its kind in the nation. Under Crittenden’s leadership, the DHS Division of Child Support Services has been recognized for its Parental Accountability Court program. The PAC program is a collaborative effort between the Department and Superior Court judges that helps chronic nonpayers of child support avoid incarceration by addressing and overcoming barriers to meeting their support obligations. Prior to her tenure at DHS, Crittenden served as Executive Vice President and Chief Operating Officer of the Georgia Student Finance Commission, where she promoted increased access to education for Georgians beyond high school. She also has served as General Counsel at Morehouse College, Executive Vice President and General Counsel at the Georgia Student Finance Commission and Assistant Vice Chancellor of Legal Affairs-Contracts for the Board of Regents of the University System of Georgia. She also was an Assistant County Attorney in DeKalb County and an Associate at the law firm of Powell, Goldstein, Frazer & Murphy. She received her Bachelor of Arts degree from Yale University and her Juris Doctorate from the University of Michigan School of Law. Crittenden resides in Tucker, Georgia. She has one daughter.